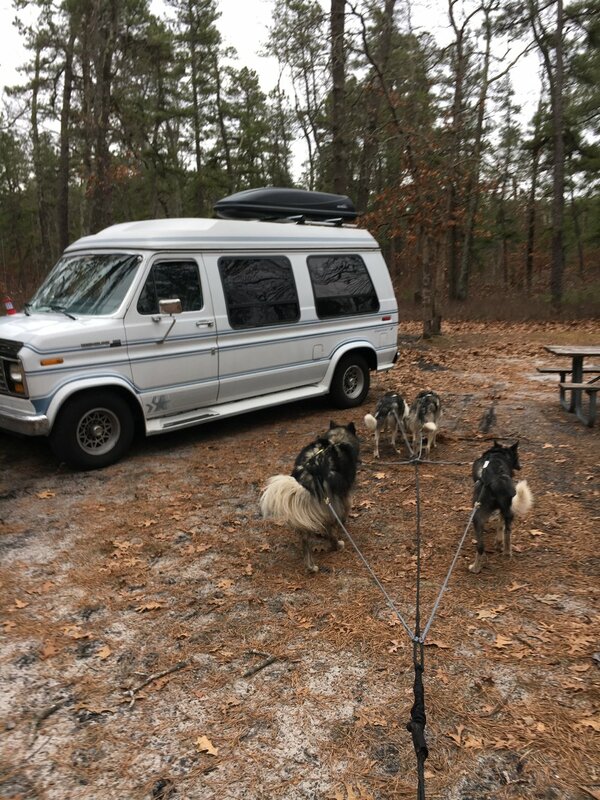 Last weekend, the pack and I piled in the van and drove four hours north to the Northern New England Sled Dog Trade Fair and Seminars in New Hampshire. I've been mushing for about seven years now, but never had the chance to attend the trade fair. Realizing this might be my last opporunity if I move west, I decided to make the trip. This was also the furthest I've ever driven without another human along for the ride. I expect to do a lot of solo traveling in California, so this was a good trial run—just me and the dogs. Four hours (well, more like five with traffic) wasn't a bad drive to do over a long weekend. Hell, I did four hour round trip commutes when I took trains into Manhattan, and that was all in one work day. The trade fair was a really fun experience and definitely something any beginner should make a point to attend. It's a great place to learn about the sport, stock up on gear, meet experienced mushers, and run your dogs. For more seasoned mushers, it's nice to see familiar faces from throughout the northeastern mushing community. And of course, who doesn't want to talk about dogs for two days straight? Jaye and Hanky go over harness fitting. Besides seeing old friends (and meeting internet friends for the first time), my favorite part of the event was the seminars. Jaye of Sibersong (Denali and Willow's breeder) gave a great talk on the mechanics of dog mushing. Even though I'm not new to the sport, I still picked up some useful tips. Lisbet Norris (3-time Iditarod finisher) spoke about her mushing heritage and how her family has preserved the function and appearance of the Siberian Husky in Alaska for over sixty years. I might have teared up several times during her talk. My favorite seminar was by Charles J. Berger. He spoke about "the big bang through chihuahuas", and basically wrapped my two favorite subjects (evolutionary science and dogs) into a beautiful presentation. Unexpected and delightful. There was plenty of dog talk, dog gear, and dog friends to occupy my time, but I can't forget the dogs themselves. Aside from being a little bit overexcited to see other dogs while on the dropline, they were easy to manage and faired well in the cold, rainy weather. I walked the purebreds around the trade show and had them visit with their breeders (Blitz's reunion was especially sweet). 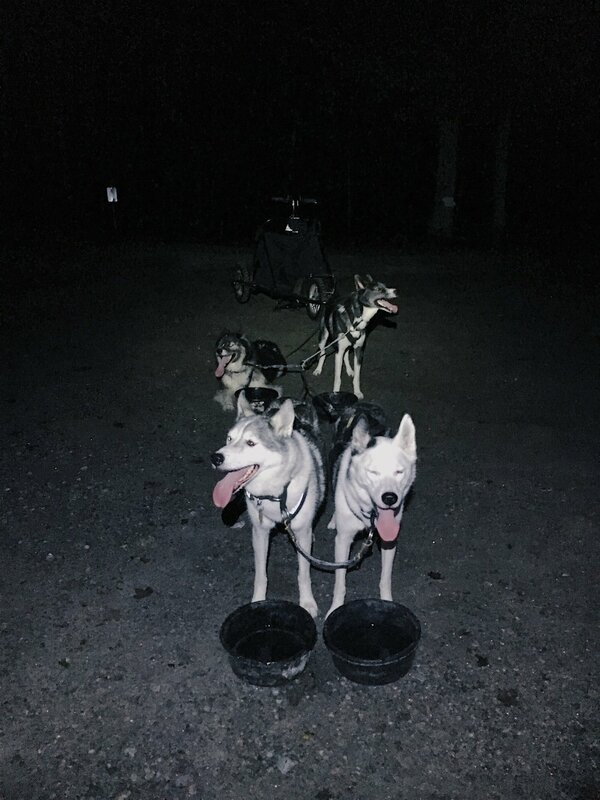 We even got to do a quick training run with some Sibersong relatives and their musher, Megan, on Saturday and competed in a dryland fun race on Sunday. The most surprising part of our race was how well the dogs passed another team. They've always been good about getting to the race chute and returning to their dropline afterwards, but passing during a run has been hit or miss. I was especially curious to see how Blitz would do, since he's never ran a race before—or even trained alongside other teams. I think he must have been the missing piece of the puzzle, because he and Knox (who is prone to being a jerkoff) passed flawlessly. I hope I don't jinx it, but I couldn't be happier with how they did. 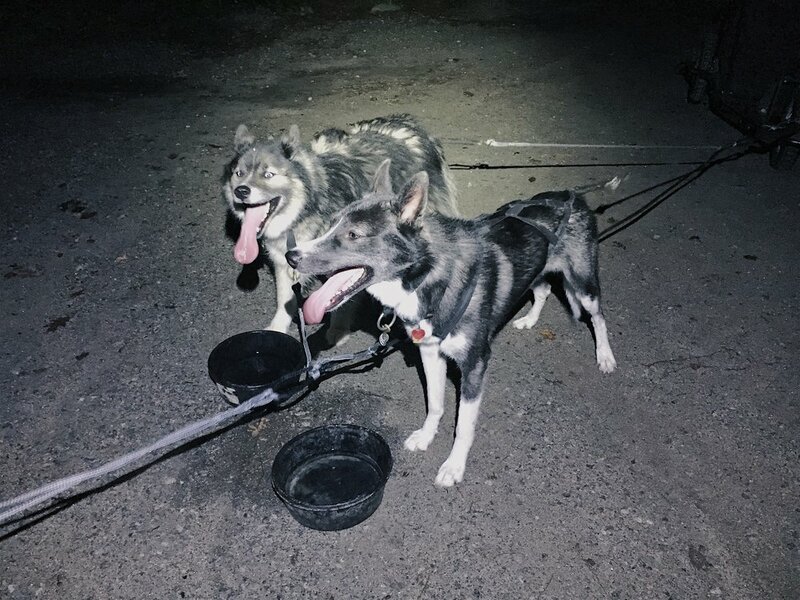 We got third place behind two very speedy Alaskan Husky teams, completing a 0.8 mile trail in 2 minutes and 43 seconds. We're back home now and picking back up with fall training. 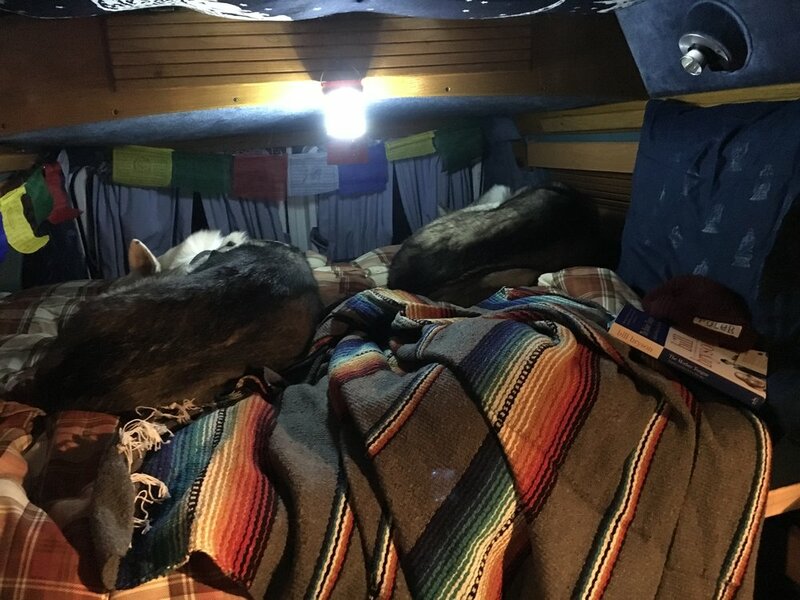 We have plans to head back up to New Hampshire later in the month (or beginning of next, not sure yet) to attend a camping weekend with some of the same mushers from the trade show. I've got a lot of big plans in store for the remainder of this year and beginning of next, so stay tuned for what will (hopefully) be our most interesting season yet. The first run of our season is complete—put it in the books. Mid-August is definitely the earliest we've ever run and the temperatures are just barely there. I woke up at 4 AM to get to a new trail just before 5 AM. It was in the mid-50s in the woods (according to my temperature gauge) but the humidity was rolling in fast, so we kept things short. Mostly, I was excited to find a rail trail 25 minutes from the Pawling house, with lots of level dirt and gravel. I can squeeze out almost eight miles total in this spot, though we started with a quick 2.4 miler this morning. The next few weeks look relatively warm (and I'm taking a quick camping trip up to Maine next weekend) so I doubt we'll log any more miles until September. In the meantime, I'm enjoying the calm that only comes after a solid morning run. Despite unseasonably cool temperatures, our mushing season has come to an official end, marked by Blitz’s neuter surgery. His recovery is going fine, but it looks like we’re headed into a heat wave next week. 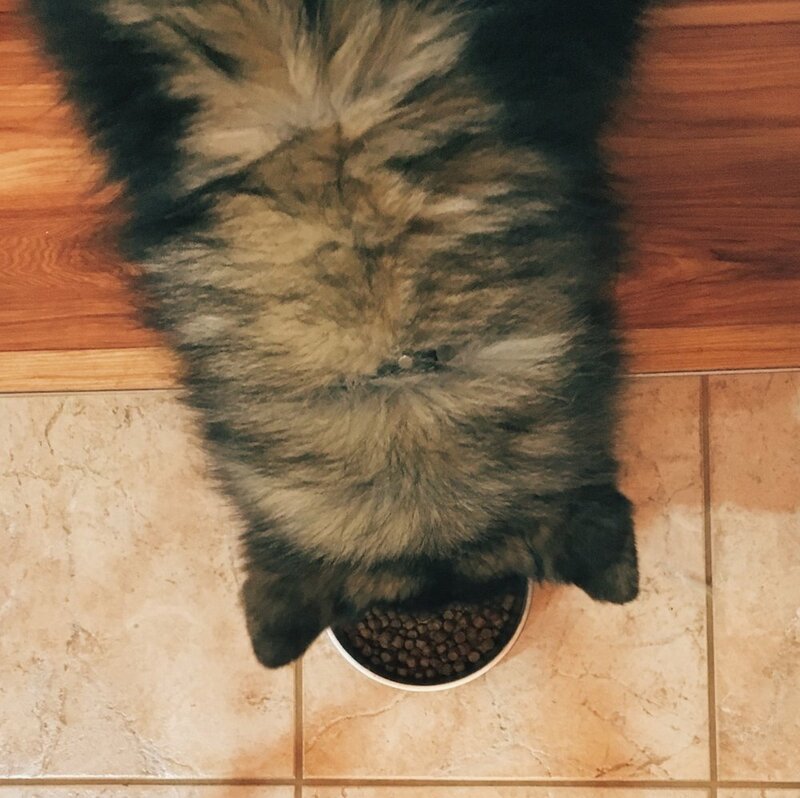 Some of the dogs can be picky eaters, so I usually add a spoonful of canned food to their kibble. I’ll switch this up from month to month to give them more variety since they do seem to get bored with the same thing all the time. I’ll also look for higher fat and protein foods during the season, then switch to regular formulas during the off season. I’ve been feeding a lot of Nutro Max canned dog food, as it’s priced pretty low (around $16 for 12 cans) while still having good ingredients. The dogs were enjoying it for awhile, but they started to lose interest. This month, the Chewy Influencer program* hooked me up with some free Taste of the Wild canned food. I’ve wanted to try this brand for awhile, admittedly because of the wolf artwork on the cans, but it was pricier (almost $30 for 12 cans) than I wanted to spend for a kibble-topper. For nearly double the price of the Nutro cans, I hoped the dogs would really dig into the Taste of the Wild food. So far, I’ve had mixed results. The first feeding at home went over well, probably because they hadn’t been getting any canned food toppers for a day or two. Now that we’re up in Pawling, Denali is back to her usual picky tendencies. I have to watch or Blitz will clean off any uneaten bowl. Overall, Taste of the Wild is better if you’re looking for a grain free solution, but my dogs don’t have any dietary issues with grain. Beef as the first ingredient is also better, but overall both are pretty decent options. 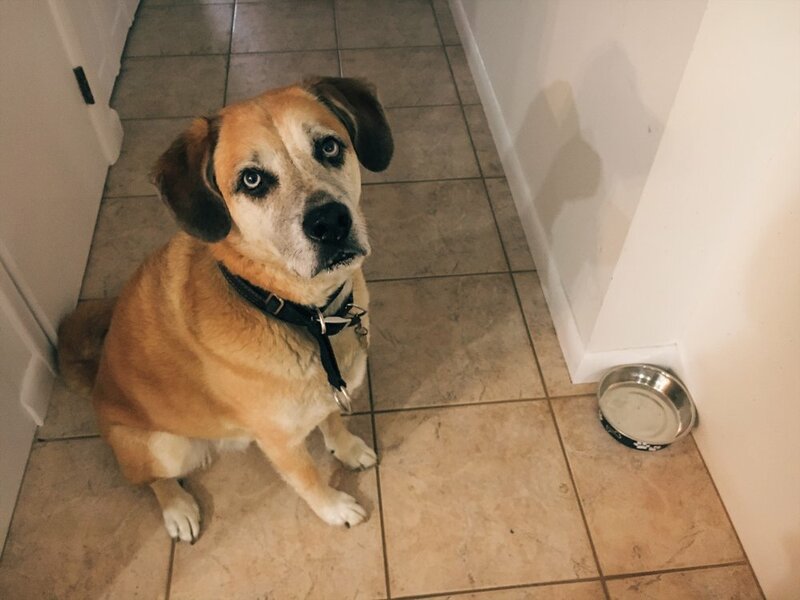 If your dog can handle wheat and grains, and you’re looking to save some money, I’d go with Nutro. It should also be noted that my dogs rather gnaw on groundhogs or eat garbage, so their taste-testing ability is a little questionable. 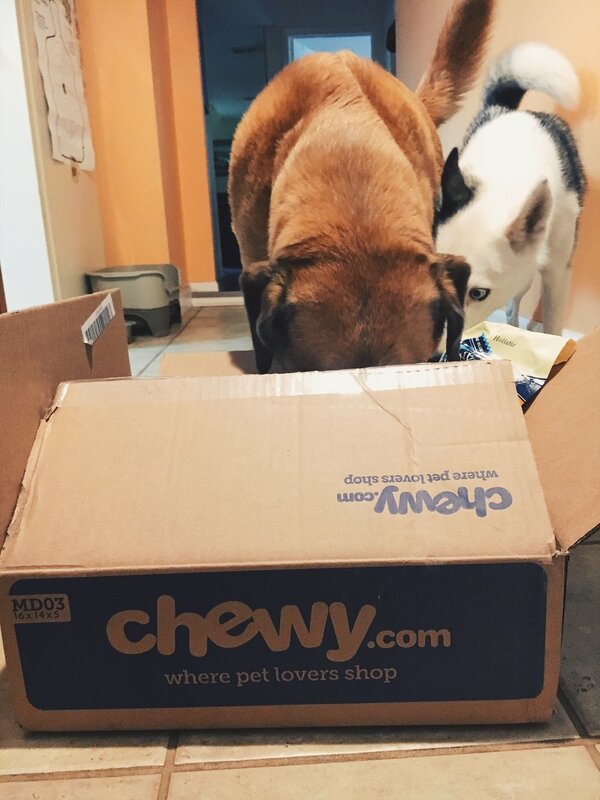 I have Chewy.com auto ships set up, so my paychecks get funneled from my bank account directly into dog food that’s shipped to my door (the paycheck to poop turnaround is remarkable). There are very few stores that offer the brands I buy and I certainly don’t have time to pick up food every month. The total cost isn’t as bad as you might think to feed five mouths—efficient metabolisms combined with auto ship discounts keep things reasonable. Aside from their morning and evening meals, the dogs get a variety of chews, biscuits, and treats every day. I tend to try something new each month, along with regular ol’ Milkbone dog biscuits and Dentastix before bed. Oh, and they often get bits of raw meat here and there, depending on what I have in the fridge. After writing all that, it does seem like quite an ordeal. After years of owning multiple dogs, I think I’ve got the process down pretty well. Their annual wellness exams show they’re maintaining healthy weights, shiny coats, clean teeth, and strong muscles. So I must be doing something right. 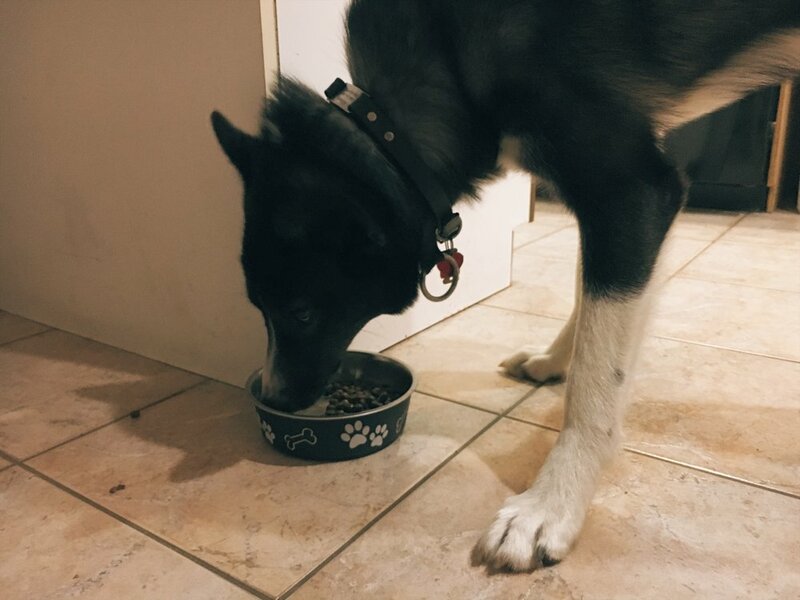 *I received Taste of the Wild canned dog food free of charge from Chewy.com in an exchange for my honest review. I finally got a chance to take the van out for her first overnight camping trip. I decided to only book one night at a campground I'm very familiar with, assuming this would be a sort of "test run". I've camped in plenty of tents, but I'm new to this whole van life thing. We rolled down to the NJ Pine Barrens just after noon. I had first dibs for the dog-friendly sites, and not surprisingly, didn't see another soul the entire time. As soon as I got the dogs out to stretch, they started yodeling, so any plans I had of setting up were quickly dashed. I hooked them up and set out for a brief run, which accidentally turned into over six miles. I've been limiting Blitz's runs, so I wasn't planning on doing more than four miles with him on the team. Somehow, I took a few wrong turns and our quick run became much longer. If you've never been to the Pine Barrens, you should know that it all looks exactly the same. It's taken me dozens of runs on a specific trail to recognize its features, so starting at a new spot threw it all off. Even with a working GPS, I couldn't quite figure out where we were. We did make it back, of course. Blitz had no trouble and proceeded to dig a giant hole while the other dogs rested. 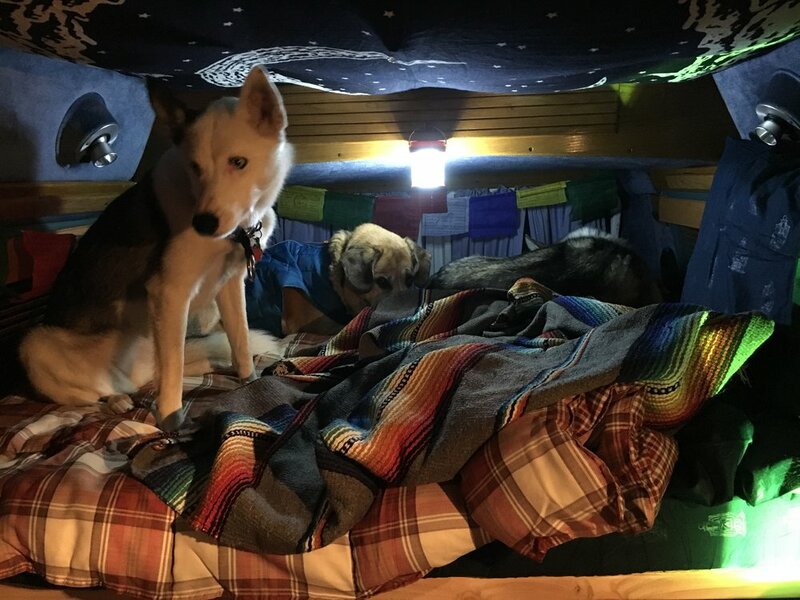 After our run, I attempted to put up a hacky awning I had thought up. 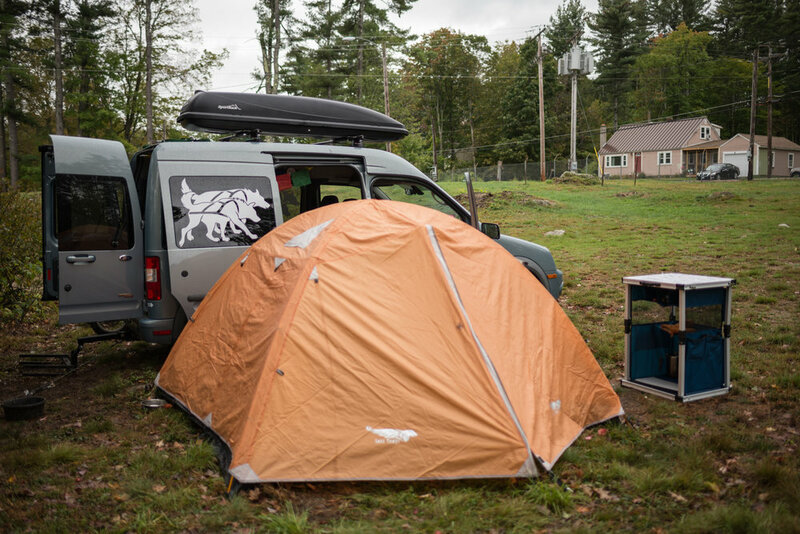 The plan was to attach a tarp to the roof of the van using suction cup clips and to prop it up with 8' tent poles. This failed entirely; the suction cups would not stick to the van's roof at all. Aside from that, the tarp I bought off Amazon was utter crap. The grommets were on nylon webbing, which tore off immediately. I didn't even pull the tarp taut - just lifting it to the roof of the van made them tear away. I threw it in the trash and was thankful I didn't actually need overhead cover. I'll have to revisit the awning idea. Winter camping has its downsides*. In other seasons, I tend to go to sleep after it gets dark and rise with the sun. Can't really do that at 5:00 PM. 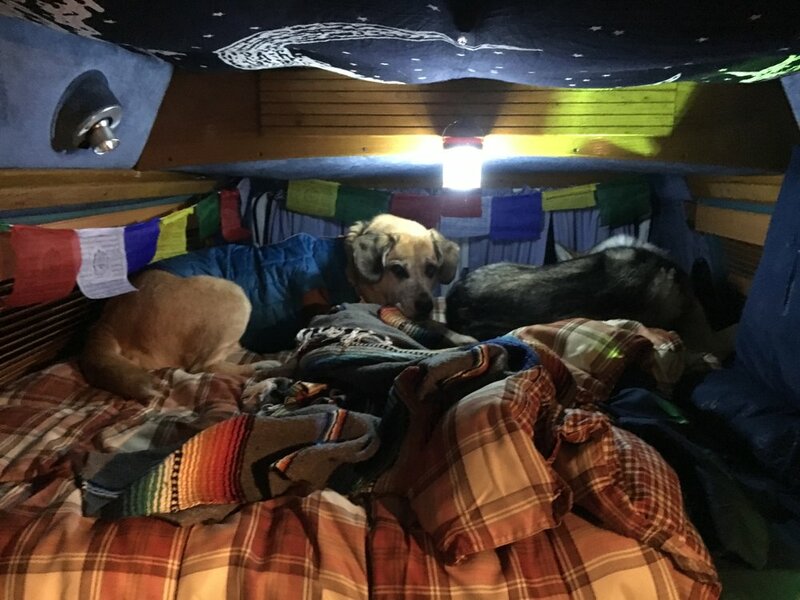 I built a fire and cooked up a veggie burger, but once I was out of wood, I decided to load into the van for the remainder of the night. The dogs weren't too sure what to do. After a bit of shuffling around, I got each of them settled. 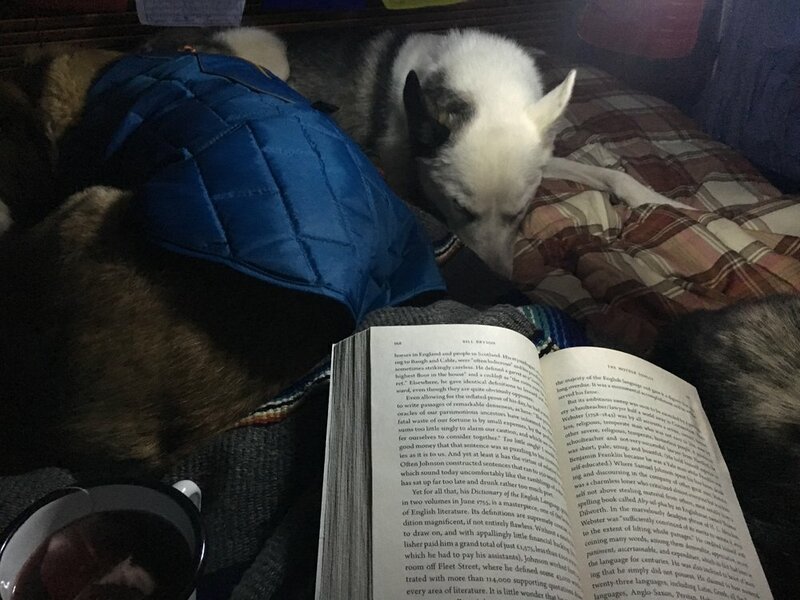 Just like at home, Dexter, Denali, and Willow slept in the bed and Knox and Blitz slept beneath us. The cold started to creep in around 7 or 8:00 PM, so I plugged in the little electric heater the van's original owner gave me. It helped, but not quite enough, so I used my propane camp stove to make tea. (Remember: ventilate if you cook inside a van or tent! Or you WILL die.) This warmed the van up enough to be comfortable while I read and avoided reality for a little while. My phone crapped out pretty early, since I wasn't charging it and the temperatures were low. The next morning I couldn't get it to stay on, so we set out for a brief run without any GPS to save us. I played it safe and managed four miles (like I had originally planned) by running a big square. Once we got back to camp, I was eager to get back home, but Rover had other ideas. The condensation on the windows had frozen over night, and for whatever reason, the heat wouldn't turn on. Usually it kicks on when I start driving, but alas, I could not see to drive. My lazy desire to grab a Wawa breakfast sandwich was defeated, and I cooked up some eggs and coffee to defrost the ice. Ultimately, the first overnight in the van went fairly well. There's definitely things I need to consider for the future, but overall, it was a nice little escape. 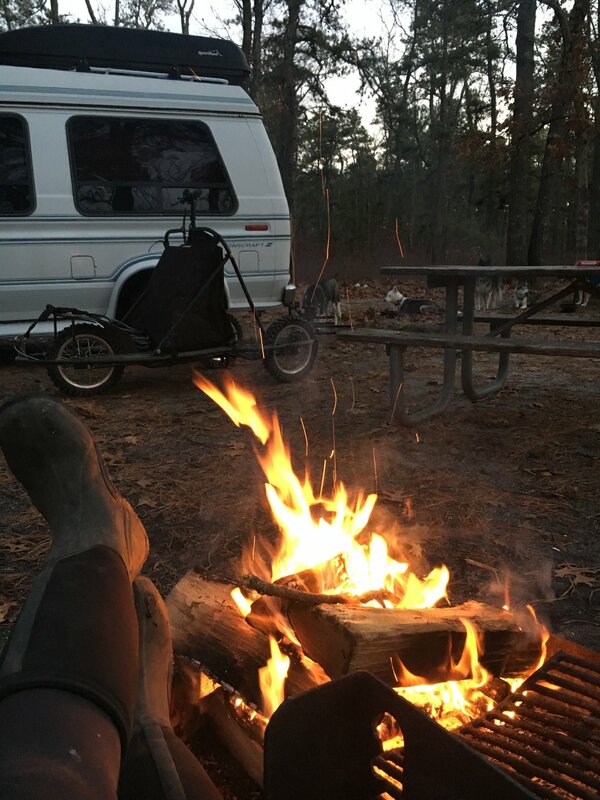 * LOL I know what you're thinking, what are the upsides of winter camping? Well, if you're not a dog musher, there are some other perks. Zero bugs, for one. And you pretty much have the entire woods to yourself. Because you're crazy and it's 25 degrees.